Jovis, 10 die Junii ; Anno 11 Georgii IV ti Regis, 1830. Account of Margate Pier and Harbour, Company, presented. Account from East India Company, presented. Petition against Graziers' (Ireland) Steam Company Bill. Amendments to Dovor Improvement Bill, agreed to. Poore's Estate Bill, reported and passed. Hildyard's or Hutton's Estate Bill, reported and passed. Motion respecting Clyde Navigation Bill. Galway Dock and Canal Bill. The Lords have passed New River Company's Estate Bill. Report from Committee on East India Company's Affairs. No.514. Petition against Administration of Justice Bill. Account of Public Records (Ireland), ordered. Petition against Contribution to Greenwich Hospital. Petition for repeal of Duty on Hops. Petition for Legislative Enactment relative to Dogs. Petition for repeal of Union with Ireland. Landward Parishes (Scotland) Bill, presented. No. 516. Report from Hackney Coach Office Committee. No. 515. Petitions against Chancery Register Bill. Papers, &c. presented: Welsh Judicature. No.517. Supplemental Report, Courts of Justice (Ireland.) No. 518. Address for Report on Real Property. Petition against Appointment of Commissioners, Northern Roads. Address for Papers respecting Greece. Motion respecting Court of Chancery. Suits in Equity Bill, deferred. Masters in Chancery Bill, deferred. Sale of Beer Bill, deferred. Roman Catholic Charities Bill, deferred. Deserted Children (Ireland) Bill, deferred. Sub-letting Act Amendment (Ireland) Bill, deferred. Insolvent Debtors (Ireland) Bill, deferred. Committee on Assessed Taxes Composition Act, deferred. Committee on Beer and Cider Duties Acts, deferred. Court of Session (Scotland) Bill, deferred. Stage Coach Proprietors Bill, deferred. Consolidated Fund (£.4,000,000) Bill, committed. Canine Madness Bill, presented. No. 519. Papers, &c. ordered: Prosecutions by the Treasury. New River Company's Estate Bill, read. THE House being informed that Mr. Cobb, from the Margate Pier and Harbour Company, attended at the door, he was called in; and at the bar presented to the House, pursuant to the directions of an Act of Parliament,-An Account of the Receipts and Expenditure of the Margate Pier and Harbour Company, from the 6th of April 1829 to the 6th of April 1830, both days inclusive:-And then he withdrew. Ordered, That the said Account do lie upon the Table. The House being informed that Mr. Bridges, from the Tenths Office, attended at the door, he was called in; and at the bar presented to the House, pursuant to their Order, -An Account of all sums of Money paid into the Tenths, Portugal-street, Lincoln's Inn Fields, during the ten years last past, by the several Archbishops, Bishops, and other Dignitaries of England and Wales, which has been paid over by the Tenths Office to His Majesty's Exchequer, and from thence to Queen Anne's Bounty:-And then he withdrew. The House being informed that Mr. Danvers, from the Court of Directors of the East India Company, attended at the door, he was called in: and at the bar presented to the House, pursuant to the directions of an Act of Parliament,-Annual Account, made up to the 1st day of May 1830, containing the amount of the Proceeds of the Sale of Goods and Merchandize of the East India Company in Great Britain, and of their Commercial and other Receipts, Charges and Payments in Great Britain, under the several heads thereof; together with an Estimate of the same for the current year, and a Statement of their Bond Debts and Simple Contract Debts, with the rates of Interest they respectively carry, and the amount of such Interest, and the state of Cash remaining in their Treasury, and other effects appertaining to the Company in Great Britain, and afloat; distinguishing the Receipts and Payments, Debts and Assets, in the Political and Territorial Branch, from the Receipts and Payments, Debts and Assets, in the Commercial Branch:-And then he withdrew. A Petition of Merchants, Traders, and other Inhabitants of the city of Dublin, was presented, and read; taking notice of the Bill for regulating and incorporating a Company in Ireland, to be called "The Irish Graziers' Steam Marine Company;" and praying, That the same may not pass into a law. Pr. 5. 1. 2. Leave out "Quarter" and insert "fifth." Pr. 5. 1. 3. Leave out "immediately preceding" and insert "of July One thousand eight hundred and twentynine." Pr. 6. 1. 12 & 13. Leave out "up to the Quarter-day" and insert "for the year." Pr. 6. 1. 17. After "Office" insert "Provided always, That all the said Commissioners who shall vacate their seats by lot as aforesaid, shall be eligible to be reelected immediately afterwards, or at any subsequent election." Pr. 12. 1. 28. Leave out "or" and insert "and." Pr. 86. 1. 20. Leave out "appointing." Pr. 101. 1. 35. Leave out "where" and insert "when." Ordered, That Mr. Trant do carry the Bill to the Lords; and acquaint them, that this House hath agreed to the Amendments made by their Lordships. Sir John Astley reported from the Committee on the ingrossed Bill from the Lords, intituled, An Act for exchanging a fee simple Estate belonging to Edward Dyke Poore, Esquire, situate at Ablington, in the County of Wilts, for an Estate under Settlement, devised by the Will of the late Edward Poore, Esquire, situate at North Tidworth, in the same County, and for authorizing the investment of a sum of Money in the purchase of other Lands, to be settled to the like uses; That they had examined the allegations of the Bill, and found the same to be true; and that the parties concerned had given their consent to the Bill to the satisfaction of the Committee; and that they had gone through the Bill, and had directed him to report the same to the House without any Amendment; and the Bill was read the third time. Ordered, That Sir John Astley do carry the Bill to the Lords; and acquaint them, that this House hath agreed to the same, without any Amendment. Mr. Charles Chaplin reported from the Committee on the ingrossed Bill from the Lords, intituled, An Act for vesting the Estates in the County of Lincoln, devised by the Will of Mary Hutton, deceased, in Trustees, upon trust, to sell the same, and for laying out the Monies arising from such Sales in the purchase of more convenient Estates, to be settled to the same uses; That they had examined the allegations of the Bill, and found the same to be true; and that the parties concerned had given their consent to the Bill, to the satisfaction of the Committee; and that they had gone through the Bill, and had directed him to report the same to the House, without any Amendment; and the Bill was read the third time. Ordered, That Mr. Chaplin do carry the Bill to the Lords; and acquaint them, that this House hath agreed to the same, without any Amendment. A Motion was made, and the Question was proposed, That the Bill be re-committed to the former Committee: -And the said Motion was, with leave of the House, withdrawn. Resolved, That in the case of the Petition, complaining of non-compliance with the Standing Orders in respect to the Glasgow and Kilmarnock Road Bill, that the parties for the Bill be permitted to proceed therewith. The Lords have commanded us to acquaint this House, That the Lords do request that this House will give leave to John Stewart, Esquire, a Member of this House, to attend their Lordships, in order to his being examined as a Witness before the Select Committee appointed by their Lordships to inquire into the present State of the Affairs of the East India Company, and into the Trade between Great Britain, the East Indies and China:-And then the Messengers withdrew. The House proceeded to take into consideration the last part of the said Message: And Mr. Stewart, being present, stood up in his place, and declared, that he was willing, with the leave of the House, to go to the House of Lords, as is desired by their Lordships in their said Message. Resolved, That John Stewart, Esquire, have leave to go to the House of Lords, as is desired by their Lordships in their said Message, if he think fit. And the Messengers were again called in, and Mr. Speaker acquainted them therewith:-And then they again withdrew. Mr. Ward reported from the Select Committee appointed to inquire into the present State of the Affairs of the East India Company, and into the Trade between Great Britain, the East Indies and China; and to report their observations thereupon to the House; and who were empowered to report the Minutes of the Evidence taken before them from time to time to the House; That they had made a further progress in the matters to them referred, and examined several other witnesses, the Minutes of whose Evidence they had agreed to report to the House up to the 3d day of this instant June inclusive; and the Report was brought up, and read. Ordered, That the Report do lie upon the Table; and be printed. A Petition of the Gentlemen and others, inhabiting the baronies of Lower Conelloe and Shannit, in the county of Limerick;-and, of the Clergy, Gentry and Freeholders of the county of Tipperary,-were presented, and read; setting forth, That the Petitioners are of opinion, that any increase of the Duty on Spirits in Ireland, will be to diminish the revenue, revive illicit distillation, and depreciate the produce of agriculture in that country; that the additional Duty proposed to be placed, on Newspapers and Advertisements will, in its effect, put down a large proportion of the Irish Press; and that any additions to the Duties on Law Stamps will operate as a denial of justice to the poorer classes of suitors, and will have a tendency to diminish rather than increase the revenue; that the contemplated Duty on Tobacco cultivated in Ireland is calculated to paralyze any exertions which Ireland is disposed to make towards the employment of her numerous and indigent population; and praying; That the House will, in mercy to the distressed condition of Ireland, refuse their sanction to imposts so galling to the feelings, and prejudicial to the intrests of the people. A Petition of the Nobility, Gentry, Clergy and Freeholders of the King's County, was presented, and read; setting forth, That the Petitioners have heard with dismay the proposed measure of the Chancellor of the Exchequer to alter the relative Duties on Rum and homemade Spirits, which, if carried into effect, will ruin the agricultural interest of that country, and prove destructive to the labouring poor; and praying the House will take the matter into their serious consideration, and leave unaltered the relative Duties on Rum and home-made Spirits. A Petition of the Nobility, Gentry, Clergy and Freeholders of the King's County, was presented, and read; setting forth, That the proposed measure for assimilating the Stamp Duties of Ireland to those of England, so far from augmenting the revenue, the object sought to be attained by the Chancellor of the Exchequer, will, in the judgment of the Petitioners, considerably diminish it, for the Petitioners respectfully assert, that a reduction in the rate of many of the existing taxes in Ireland is proved, by experience, to be the best mode of adding to the national income, consistently with the interests of the country; that additional Duties on the Stamps and Advertisements of Newspapers, by contracting their circulation, and at the same time increasing the expense of advertising in them, would prove fatal to the prospects of their proprietors, and highly detrimental to the commerce of Ireland; and praying the House to take the premises into their consideration, and not to increase the present Duties on Stamps in Ireland. Ordered, That leave be given to give Notices of leave having been granted to bring in the said Bill, twice in the London Gazette, and twice in one and the same newspaper published in the County of Sussex, and by affixing such Notice on the door of the Town Hall of Rye; and that the Committee on the said Bill do examine, in the first place, how far the said Orders have been complied with; and do report the same to the House on the Report of the Bill. A Petition of Surgeons residing in the county of Tipperary, was presented, and read; setting forth, That the Petitioners are graduates of the Royal Colleges of Surgeons of Edinburgh and London, and, as such, practise surgery by the same authority as the greater part of the surgeons of the British empire; that whilst the Petitioners, in common with all those who have obtained surgical degrees at Edinburgh, London and Glasgow, are eligible to be appointed to any surgical situation, whether civil, naval or military in Great Britain or its dependencies, they labour under the most serious disadvantages, and suffer considerable grievances, in being inadmissible to be appointed Surgeons to County Infirmaries in Ireland; and praying, That the House will take into its most serious consideration the disadvantages which arise to the public from the present mode of appointing Surgeons to County Infirmaries in Ireland, and the grievances under which the Petitioners labour; and that they will be pleased to repeal so much of the laws relating to those institutions as exclude the Petitioners from the office of Surgeon to County Infirmaries in that country; and further, that the House (seeing the great advantages which must result, and which, as can be proved, if the Petitioners be allowed an opportunity of doing so, actually do result, in a few places in that country, but more extensively in Great Britain, from a laudable emulation and competition amongst the professional attendants on medical charities, and the greater attention which can be paid to the sick, when more than one are appointed) will also enact, that it be imperative on the Governors of County Infirmaries in any appointment that shall hereafter take place of Physicians and Surgeons to these institutions, that more than one professional attendant be elected to the same. 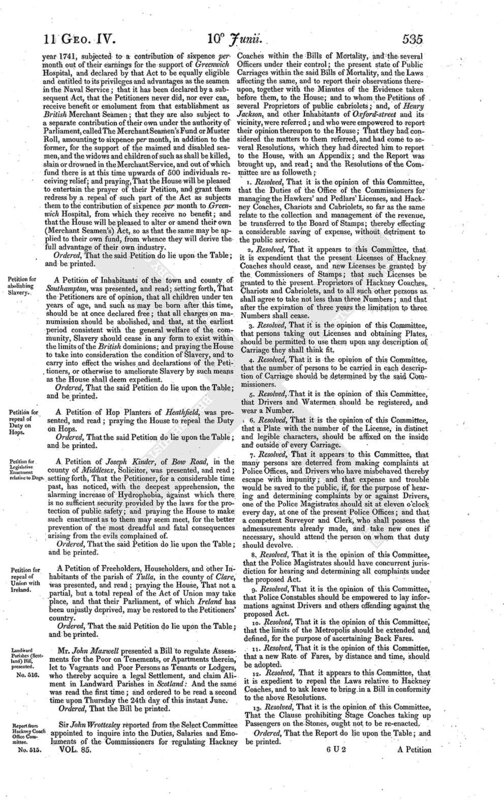 A Petition of the Mayor, Aldermen, Burgesses and Inhabitants of Macclesfield, was presented, and read; taking notice of the Bill for the more effectual Administration of Justice in England and Wales, whereby it is proposed to abolish the separate jurisdiction of the county palatine of Chester; and praying, That the same may not pass into a law as it now stands. A Petition of Inhabitants of Newark-upon-Trent, was presented, and read; setting forth, That the Petitioners, deeply impressed with a sense of the misery and degradation consequent upon the employment of Children in cleansing Chimneys by climbing, are desirous that such an inhuman practice be speedily and totally abolished; and praying the House to pass such Act for prohibiting the use of Children in climbing Chimneys, as they may deem fit. A Petition of Roman Catholics of Whitechurch and Garrocloyne;-of the United parishes of Kilmacabea and Kilfachnabeg;-and, of Landholders of the parish of Aglis, -were presented, and read; reciting the Act 7 Geo. 4, c. 72, for the regulation of Parish Vestries in Ireland; and praying, That the same may be repealed. A Petition of Landed Proprietors and Farmers of the united parishes of Maglass, Ballymore, Killinick, and Shaughmon;-of Protestant and Catholic Tithe Payers of the parish of Kilrane, in the barony of Forth, and county of Wexford;-of Parishioners of Cappoquin, in the county of Waterford;-and, of Protestant Inhabitants of the parish of Seapatrick, in the county of Down,-were presented and read; setting forth, That the Petitioners are fully convinced of the dreadful evils arising from the Tithing system in Ireland, tending as it does to paralyze the hand of industry, and thereby check the progress of agricultural improvement; and praying to be relieved from a system so pernicious to the peace and prosperity of the country, and more or less oppressive to the laity of every creed. Ordered, That the Petition of the Society for promoting the Education of the Poor of Ireland, which was presented to the House upon the 11th day of March last, be printed. A Petition of the Local Directors and Manager of the Provincial Bank of Ireland at Waterford, was presented, and read; setting forth; That the Petitioners, as bankers, are deeply interested in the protection of property from Forgery, and in the conviction and punishment of persons guilty of that crime; that the Petitioners find, by experience, that the infliction of death, or even the possibility of the infliction of death, has a tendency to prevent the prosecution, conviction and punishment of the criminal, and thus endangers the property which it is intended to protect; and praying, That the House will not withhold from them that protection to their property which they would derive from a more lenient law. Ordered, That there be laid before this House, a detailed Account of the several Works which are now in progress under the authority of the Commissioners of Records in Ireland; as also of those contemplated by them in the execution of their Commission; specifying the time and expense which may be required for their completion, and the present state of proceedings relating thereto; together with a List of the several Volumes, whether printed, fairly transcribed for public use, now at press, or in progress of publication. Ordered, That the Bill for the Relief of the Representatives of Persons who have died intestate in the Presidency of Madras, in the East Indies, and for the Relief of the Suitors of the Supreme Court of Judicature at Madras aforesaid, be read a second time upon Thursday next. Ordered, That the united Company of Merchants trading to the East Indies be heard by their counsel upon the second reading of the said Bill. A Petition of Trustees in the name and on the behalf of the Ship-owners and Merchant Seamen of the port of Whitby, was presented, and read; setting forth, That the Merchant Seamen of that port are, by a private Act in the year 1741, subjected to a contribution of sixpence per month out of their earnings for the support of Greenwich Hospital, and declared by that Act to be equally eligible and entitled to its privileges and advantages as the seamen in the Naval Service; that it has been declared by a subsequent Act, that the Petitioners never did, nor ever can, receive benefit or emolument from that establishment as British Merchant Seamen; that they are also subject to a separate contribution of their own under the authority of Parliament, called The Merchant Seamen's Fund or Muster Roll, amounting to sixpence per month, in addition to the former, for the support of the maimed and disabled seamen, and the widows and children of such as shall be killed, slain or drowned in the Merchant Service, and out of which fund there is at this time upwards of 500 individuals receiving relief; and praying, That the House will be pleased to entertain the prayer of their Petition, and grant them redress by a repeal of such part of the Act as subjects them to the contribution of sixpence per month to Greenwich Hospital, from which they receive no benefit; and that the House will be pleased to alter or amend their own (Merchant Seamen's) Act, so as that the same may be applied to their own fund, from whence they will derive the full advantage of their own industry. 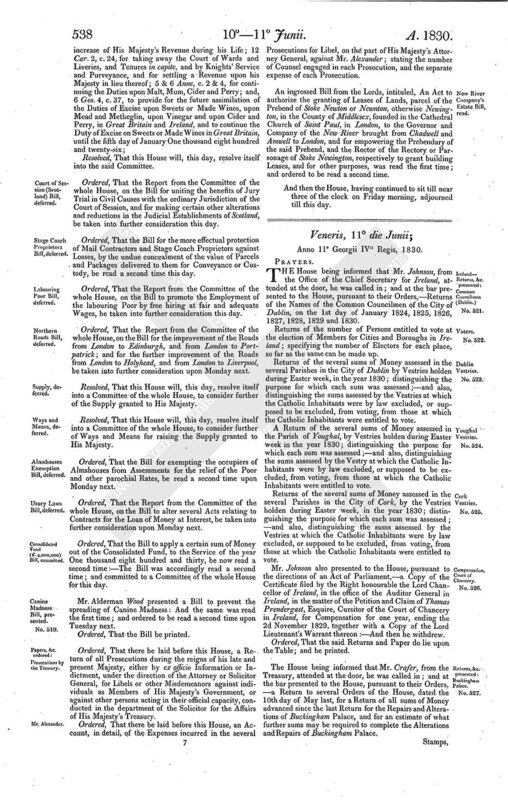 A Petition of Inhabitants of the town and county of Southampton, was presented, and read; setting forth, That the Petitioners are of opinion, that all children under ten years of age, and such as may be born after this time, should be at once declared free; that all charges on manumission should be abolished, and that, at the earliest period consistent with the general welfare of the community, Slavery should cease in any form to exist within the limits of the British dominions; and praying the House to take into consideration the condition of Slavery, and to carry into effect the wishes and declarations of the Petitioners, or otherwise to ameliorate Slavery by such means as the House shall deem expedient. A Petition of Hop Planters of Heathfield, was presented, and read; praying the House to repeal the Duty on Hops. A Petition of Joseph Kinder, of Bow Road, in the county of Middlesex, Solicitor, was presented, and read; setting forth, That the Petitioner, for a considerable time past, has noticed, with the deepest apprehension, the alarming increase of Hydrophobia, against which there is no sufficient security provided by the laws for the protection of public safety; and praying the House to make such enactment as to them may seem meet, for the better prevention of the most dreadful and fatal consequences arising from the evils complained of. A Petition of Freeholders, Householders, and other Inhabitants of the parish of Tulla, in the county of Clare, was presented, and read; praying the House, That not a partial, but a total repeal of the Act of Union may take place, and that their Parliament, of which Ireland has been unjustly deprived, may be restored to the Petitioners' country. 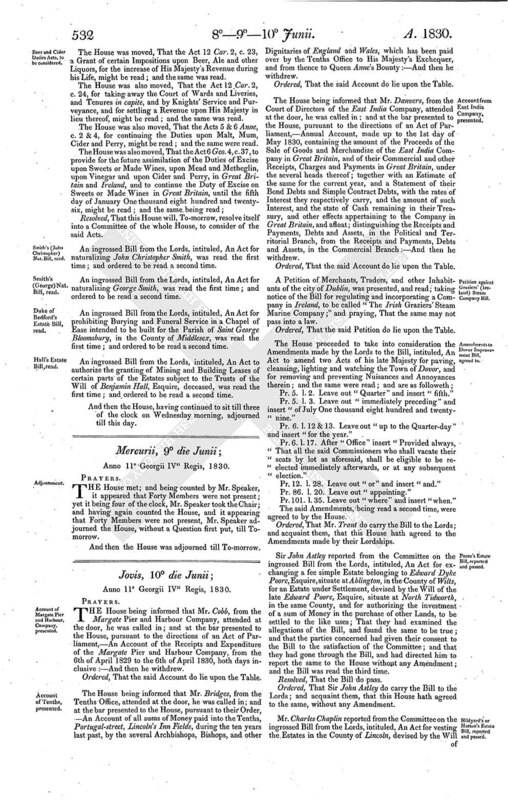 Mr. John Maxwell presented a Bill to regulate Assessments for the Poor on Tenements, or Apartments therein, let to Vagrants and Poor Persons as Tenants or Lodgers, who thereby acquire a legal Settlement, and claim Aliment in Landward Parishes in Scotland: And the same was read the first time; and ordered to be read a second time upon Thursday the 24th day of this instant June. 1. 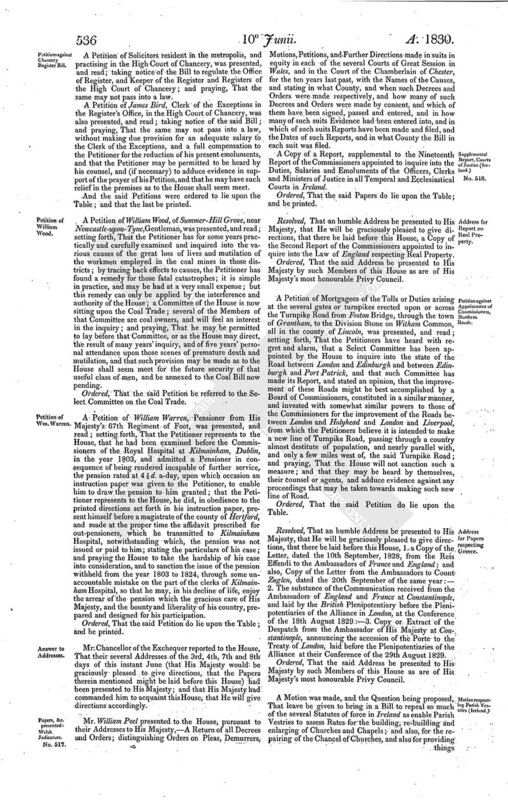 Resolved, That it is the opinion of this Committee, that the Duties of the Office of the Commissioners for managing the Hawkers' and Pedlars' Licenses, and Hackney Coaches, Chariots and Cabriolets, so far as the same relate to the collection and management of the revenue, be transferred to the Board of Stamps; thereby effecting a considerable saving of expense, without detriment to the public service. 2. Resolved, That it appears to this Committee, that it is expendient that the present Licenses of Hackney Coaches should cease, and new Licenses be granted by the Commissioners of Stamps; that such Licenses be granted to the present Proprietors of Hackney Coaches, Chariots and Cabriolets, and to all such other persons as shall agree to take not less than three Numbers; and that after the expiration of three years the limitation to three Numbers shall cease. 3. Resolved, That it is the opinion of this Committee, that persons taking out Licenses and obtaining Plates, should be permitted to use them upon any description of Carriage they shall think fit. 4. Resolved, That it is the opinion of this Committee, that the number of persons to be carried in each description of Carriage should be determined by the said Commissioners. 5. Resolved, That it is the opinion of this Committee, that Drivers and Watermen should be registered, and wear a Number. 6. Resolved, That it is the opinion of this Committee, that a Plate with the number of the License, in distinct and legible characters, should be affixed on the inside and outside of every Carriage. 7. Resolved, That it appears to this Committee, that many persons are deterred from making complaints at Police Offices, and Drivers who have misbehaved thereby escape with impunity; and that expense and trouble would be saved to the public, if, for the purpose of hearing and determining complaints by or against Drivers, one of the Police Magistrates should sit at eleven o'clock every day, at one of the present Police Offices; and that a competent Surveyor and Clerk, who shall possess the admeasurements already made, and take new ones if necessary, should attend the person on whom that duty should devolve. 8. Resolved, That it is the opinion of this Committee, that the Police Magistrates should have concurrent jurisdiction for hearing and determining all complaints under the proposed Act. 9. Resolved, That it is the opinion of this Committee, that Police Constables should be empowered to lay informations against Drivers and others offending against the proposed Act. 10. Resolved, That it is the opinion of this Committee, that the limits of the Metropolis should be extended and defined, for the purpose of ascertaining Back Fares. 11. Resolved, That it is the opinion of this Committee, that a new Rate of Fares, by distance and time, should be adopted. 12. Resolved, That it appears to this Committee, that it is expedient to repeal the Laws relative to Hackney Coaches, and to ask leave to bring in a Bill in conformity to the above Resolutions. 13. Resolved, That it is the opinion of this Committee, That the Clause prohibiting Stage Coaches taking up Passengers on the Stones, ought not to be re-enacted. A Petition of Solicitors resident in the metropolis, and practising in the High Court of Chancery, was presented, and read; taking notice of the Bill to regulate the Office of Register, and Keeper of the Register and Registers of the High Court of Chancery; and praying, That the same may not pass into a law. A Petition of James Bird, Clerk of the Exceptions in the Register's Office, in the High Court of Chancery, was also presented, and read; taking notice of the said Bill; and praying, That the same may not pass into a law, without making due provision for an adequate salary to the Clerk of the Exceptions, and a full compensation to the Petitioner for the reduction of his present emoluments, and that the Petitioner may be permitted to be heard by his counsel, and (if necessary) to adduce evidence in support of the prayer of his Petition, and that he may have such relief in the premises as to the House shall seem meet. A Petition of William Wood, of Summer-Hill Grove, near Newcastle-upon-Tyne, Gentleman, was presented, and read; setting forth, That the Petitioner has for some years practically and carefully examined and inquired into the various causes of the great loss of lives and mutilation of the workmen employed in the coal mines in those districts; by tracing back effects to causes, the Petitioner has found a remedy for those fatal catastrophes; it is simple in practice, and may be had at a very small expense; but this remedy can only be applied by the interference and authority of the House; a Committee of the House is now sitting upon the Coal Trade; several of the Members of that Committee are coal owners, and will feel an interest in the inquiry; and praying, That he may be permitted to lay before that Committee, or as the House may direct, the result of many years' inquiry, and of five years' personal attendance upon those scenes of premature death and mutilation, and that such provision may be made as to the House shall seem meet for the future security of that useful class of men, and be annexed to the Coal Bill now pending. Ordered, That the said Petition be referred to the Select Committee on the Coal Trade. A Petition of William Warren, Pensioner from His Majesty's 67th Regiment of Foot, was presented, and read; setting forth, That the Petitioner represents to the House, that he had been examined before the Commissioners of the Royal Hospital at Kilmainham, Dublin, in the year 1803, and admitted a Pensioner in consequence of being rendered incapable of further service, the pension rated at 4¾d. a-day, upon which occasion an instruction paper was given to the Petitioner, to enable him to draw the pension to him granted; that the Petitioner represents to the House, he did, in obedience to the printed directions set forth in his instruction paper, present himself before a magistrate of the county of Hertford, and made at the proper time the affidavit prescribed for out-pensioners, which he transmitted to Kilmainham Hospital, notwithstanding which, the pension was not issued or paid to him; stating the particulars of his case; and praying the House to take the hardship of his case into consideration, and to sanction the issue of the pension withheld from the year 1803 to 1824, through some unaccountable mistake on the part of the clerks of Kilmainham Hospital, so that he may, in his decline of life, enjoy the arrear of the pension which the gracious care of His Majesty, and the bounty and liberality of his country, prepared and designed for his participation. Mr. Chancellor of the Exchequer reported to the House, That their several Addresses of the 3rd, 4th, 7th and 8th days of this instant June (that His Majesty would be graciously pleased to give directions, that the Papers therein mentioned might be laid before this House) had been presented to His Majesty; and that His Majesty had commanded him to acquaint this House, that He will give directions accordingly. Mr. William Peel presented to the House, pursuant to their Addresses to His Majesty,-A Return of all Decrees and Orders; distinguishing Orders on Pleas, Demurrers, Motions, Petitions, and Further Directions made in suits in equity in each of the several Courts of Great Session in Wales, and in the Court of the Chamberlain of Chester, for the ten years last past, with the Names of the Causes, and stating in what County, and when such Decrees and Orders were made respectively, and how many of such Decrees and Orders were made by consent, and which of them have been signed, passed and entered, and in how many of such suits Evidence had been entered into, and in which of such suits Reports have been made and filed, and the Dates of such Reports, and in what County the Bill in each suit was filed. A Copy of a Report, supplemental to the Nineteenth Report of the Commissioners appointed to inquire into the Duties, Salaries and Emoluments of the Officers, Clerks and Ministers of Justice in all Temporal and Ecclesiastical Courts in Ireland. Resolved, That an humble Address be presented to His Majesty, that He will be graciously pleased to give directions, that there be laid before this House, a Copy of the Second Report of the Commissioners appointed to inquire into the Law of England respecting Real Property. Ordered, That the said Address be presented to His Majesty by such Members of this House as are of His Majesty's most honourable Privy Council. A Petition of Mortgagees of the Tolls or Duties arising at the several gates or turnpikes erected upon or across the Turnpike Road from Foston Bridge, through the town of Grantham, to the Division Stone on Witham Common, all in the county of Lincoln, was presented, and read; setting forth, That the Petitioners have heard with regret and alarm, that a Select Committee has been appointed by the House to inquire into the state of the Road between London and Edinburgh and between Edinburgh and Port Patrick, and that such Committee has made its Report, and stated an opinion, that the improvement of these Roads might be best accomplished by a Board of Commissioners, constituted in a similar manner, and invested with somewhat similar powers to those of the Commissioners for the improvement of the Roads between London and Holyhead and London and Liverpool, from which the Petitioners believe it is intended to make a new line of Turnpike Road, passing through a country almost destitute of population, and nearly parallel with, and only a few miles west of, the said Turnpike Road; and praying, That the House will not sanction such a measure; and that they may be heard by themselves, their counsel or agents, and adduce evidence against any proceedings that may be taken towards making such new line of Road. Resolved, That an humble Address be presented to His Majesty, that He will be graciously pleased to give directions, that there be laid before this House, 1. a Copy of the Letter, dated the 10th September, 1828, from the Reis Effendi to the Ambassadors of France and England; and also, Copy of the Letter from the Ambassadors to Count Zuglen, dated the 20th September of the same year:- 2. The substance of the Communication received from the Ambassadors of England and France at Constantinople, and laid by the British Plenipotentiary before the Plenipotentiaries of the Alliance in London, at the Conference of the 18th August 1829:-3. Copy or Extract of the Despatch from the Ambassador of His Majesty at Constantinople, announcing the accession of the Porte to the Treaty of London, laid before the Plenipotentiaries of the Alliance at their Conference of the 29th August 1829. An Amendment was proposed to be made to the Question, by leaving out from the words "Bill to" to the end of the Question, in order to add the words "amend the Act 7 Geo. 4, c. 72, for regulating Vestries in Ireland" instead thereof. And the Question being put, That the words proposed to be left out stand part of the Question; it was resolved in the Affirmative. Tllers for the nose Sir George Clerk, 141. Ordered, That the Debate be adjourned till Tuesday next. Ordered, That leave be given to bring in a Bill to prevent the spreading of Canine Madness: And that Mr. Alderman Wood and Mr. Charles Pallmer do prepare, and bring it in. Ordered, That the Bill be read a second time upon Tuesday next. Ordered, That the Report be taken into further consideration upon Monday next. Ordered, That the Report be taken into further consideration this day. A Bill to authorize the advance of a certain Sum out of the Consolidated Fund for the completion of the Shubenaccadie Canal in Nova Scotia, was, according to Order, read a second time; and committed to a Committee of the whole House for this day. 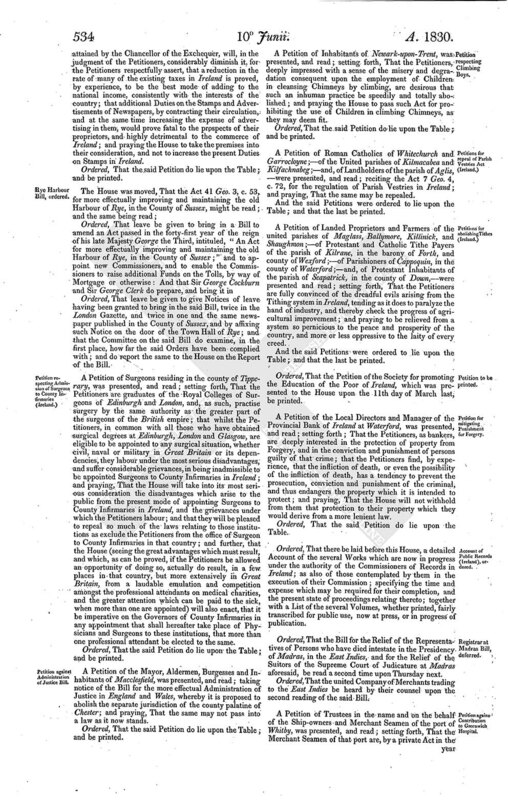 Ordered, That the Report from the Committee of the whole House, on the Bill for uniting the benefits of Jury Trial in Civil Causes with the ordinary Jurisdiction of the Court of Session, and for making certain other alterations and reductions in the Judicial Establishments of Scotland, be taken into further consideration this day. Ordered, That the Bill for the more effectual protection of Mail Contractors and Stage Coach Proprietors against Losses, by the undue concealment of the value of Parcels and Packages delivered to them for Conveyance or Custody, be read a second time this day. Ordered, That the Report from the Committee of the whole House, on the Bill to promote the Employment of the labouring Poor by free hiring at fair and adequate Wages, be taken into further consideration this day. Ordered, That the Report from the Committee of the whole House, on the Bill for the improvement of the Roads from London to Edinburgh, and from London to Portpatrick; and for the further improvement of the Roads from London to Holyhead, and from London to Liverpool, be taken into further consideration upon Monday next. Ordered, That the Bill for exempting the occupiers of Almshouses from Assessments for the relief of the Poor and other parochial Rates, be read a second time upon Monday next. Ordered, That the Report from the Committee of the whole House, on the Bill to alter several Acts relating to Contracts for the Loan of Money at Interest, be taken into further consideration upon Monday next. Ordered, That the Bill to apply a certain sum of Money out of the Consolidated Fund, to the Service of the year One thousand eight hundred and thirty, be now read a second time:-The Bill was accordingly read a second time; and committed to a Committee of the whole House for this day. 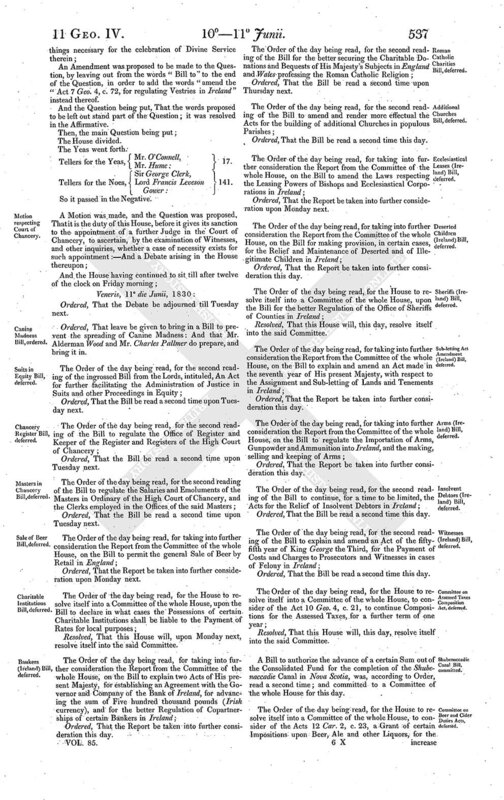 Mr. Alderman Wood presented a Bill to prevent the spreading of Canine Madness: And the same was read the first time; and ordered to be read a second time upon Tuesday next. Ordered, That there be laid before this House, a Return of all Prosecutions during the reigns of his late and present Majesty, either by ex officio Information or Indictment, under the direction of the Attorney or Solicitor General, for Libels or other Misdemeanors against individuals as Members of His Majesty's Government, or against other persons acting in their official capacity, conducted in the department of the Solicitor for the Affairs of His Majesty's Treasury. Ordered, That there be laid before this House, an Account, in detail, of the Expenses incurred in the several Prosecutions for Libel, on the part of His Majesty's Attorney General, against Mr. Alexander; stating the number of Counsel engaged in each Prosecution, and the separate expense of each Prosecution. 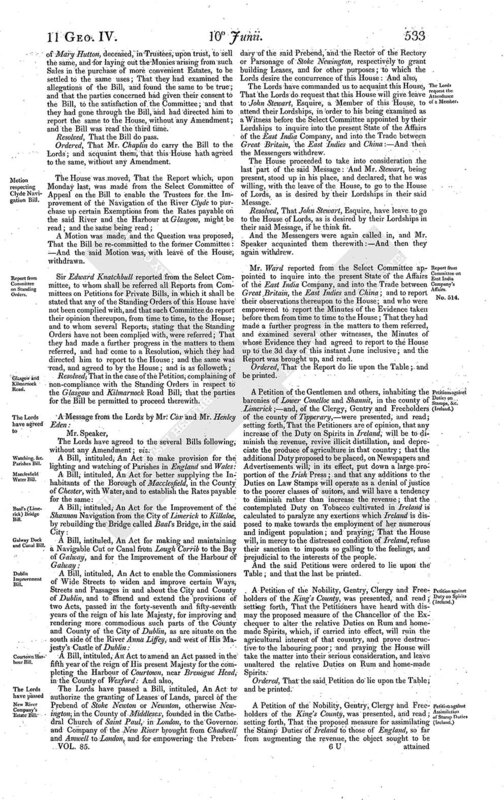 An ingrossed Bill from the Lords, intituled, An Act to authorize the granting of Leases of Lands, parcel of the Prebend of Stoke Newton or Newnton, otherwise Newington, in the County of Middlesex, founded in the Cathedral Church of Saint Paul, in London, to the Governor and Company of the New River brought from Chadwell and Amwell to London, and for empowering the Prebendary of the said Prebend, and the Rector of the Rectory or Parsonage of Stoke Newington, respectively to grant building Leases, and for other purposes, was read the first time; and ordered to be read a second time.